The heart of New Orleans. Walking back to our hotel last Saturday night, we were all stopped in our tracks by this sight. 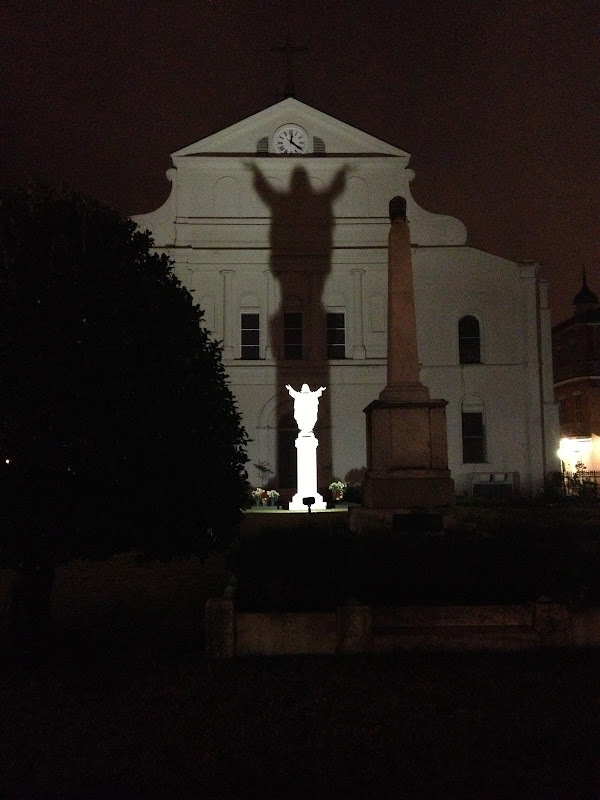 The back side of St. Louis Cathedral with the shadow of Christ cast on the wall. We call this "touchdown jesus"!!! Great pic. A perfect Sunday morning sight for me! Thank you. It is, indeed, beautiful. Did you get to take the tour of the Cathedral? It's a beauty! My Hubbs and I enjoyed our 25th Anniversary trip there in NOLA. We went to Mass in the Cathedral, it's beautiful. I was so thankful to hear that it survived Hurricane Katrina relatively unscathed. Thanks for having your camera at the ready to capture a moment like this. God Bless You Delores, thank you for sharing this picture and for your blog. Un'immagine meravigliosa,mi ha donato un'immensa emozione! I have only been to New Orleans once and I so wish I had seen this site.